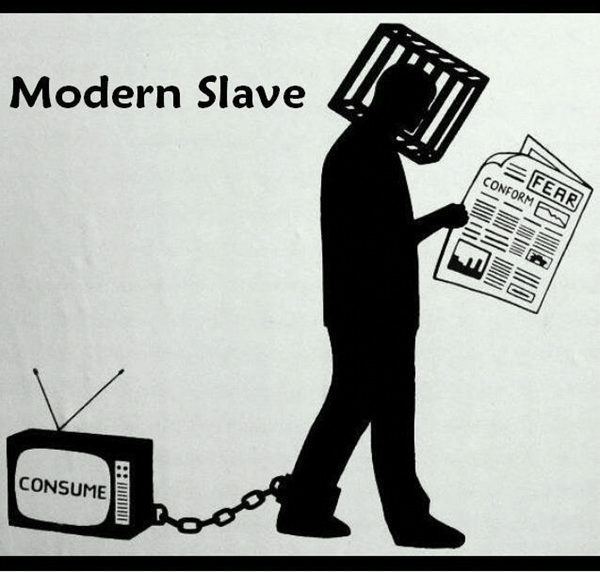 It’s no coincidence that you have this insatiable drive to consume. The government relies on this to continue their financial system. Without us, they would have no money. So, from the very beginning of life, they program within you the desire for wealth and material things. They steal your power for hours on end, keeping you sedated in front of a television, making you want things you don’t need. They make you depressed because you can’t afford the lifestyle they exploit on the television, which makes you work harder to make more money, which makes you buy more stuff, which makes them richer. This desire for money makes you take out a loan for college so you can get a high paying job. College is an entirely different scam that I won’t get into here. All I will say is everything you can learn in college you can teach yourself for free. All college does is give you a piece of paper that says you know something from someone else who has a piece of paper that says they know something. Now you can make the government even MORE money. Good job. Our consumer driven market would not work without you! The consumer! Wouldn’t it be a wise investment then, to program the generations to want to spend money on asinine things? Wouldn’t it be wise to keep them occupied with things like TV, where you can simultaneously mold their mindset to that of a valuable little money making robot? It’s genius when you really think about it, because they’ve made it so that you think it’s YOU who wants these things. But if it were you, then why are you still unhappy after you get them? Sure, you’re happy for a time, but eventually it wears off and you want something else. You’re like a dog that has seen a squirrel. This world is bigger than what our five senses have allowed for us to discover. Our perception of things is only real to us because we know no other way to experience the world. If we see it, hear it, smell it, touch it, or taste it, it MUST be real. But reality is actually just electrical impulses interpreted by your brain. You may think you’re inside a room right now because your eyes see walls surrounding you and your skin feels the “solidity” of these walls, but what you see and feel is only being interpreted by your brain, which is inside of your head. Can’t it be true then, that the room is really inside your head? Can’t it be true that you’re not touching an actual wall of anything, but your brain has been conditioned to accept these boundaries as “real” and therefor sees them as separate from it? Theoretically, we could be anywhere doing anything. We could be walking through walls we have no concept of, because our senses are not as developed. We could be living in a mental dream world for all we know, just like that movie The Matrix. Fear. Fear is what governs this dimension. Fear is a result of an ego trying to survive. Our beings, our essences, our true selves have no concept of fear. We are eternal balls of light and energy. We do not see death, but only transmutation. We use our bodies for a time, and then discard them. Our bodies are our temples, they are not us. We are the inhabitants of this temple. Your mind is a gift which controls your body, but your heart, that is your essence. This is the spiritual manifestation of the physical self. Here lies your connection with cosmic consciousness. This is your little piece of God. You are a divine entity. You are cut from the same cloth of God. God created you to experience full potential. God loves you because you are an extension of it. You are consciousness expressing itself! You are a possibility! You have a purpose that is higher than you can imagine, but first, you must kill your ego. You must free your mind. You must stop being fearful and start accepting yourself. You must stop seeking for others to validate your ego and start learning who you truly are behind it. Another’s opinion of you is none of your business. Those are their judgments. They have nothing to do with you and you should not be giving them any power over your life. It is their own insecurity and lack of self that forces them to judge another. It is the ego trying to survive by creating differences and superiorities among it’s perceived competitors. That’s all for now. I feel like napping. ← How far are you willing to go for the truth? Fighting Ego, is Ego making it all about Ego! *L* What is ‘Ego’ but ‘knowledge’ you ‘imagine’ you have acquired of some ‘mental construct’ called ‘Ego’. See the redundancy here? The only way ‘Ego’ can appear to be beaten is if it’s supplanted by ever stronger and subtler reinventions of itself. This is the nature of the beast. The more you fight ‘Ego’ the tougher it is to fight – because doing so only reinforces your belief in it. The solution/dissolution couldn’t be simpler. In fact, it’s effortless. It’s a lot like playing tic-tac-toe with yourself. If you play seriously, it always ends in a draw. There’s no reason to play unless you like wasting time and paper. If you allow yourself to win or lose, you win or lose. Yeah! I beat me! Big deal. So long as ‘Ego’ seems real, it will seem ‘others’ can walk all over you. It’s a model for exactly that sort of controlled/controlling relationship. It IS that relationship. FWIW – I’m just thinking on keyboard. Sharing thoughts, exploring the ‘Ego’ theme. This is not intended as advice – as there’s nothing you need to do about this. I see where you’re coming from with this. I use the term ego as a collective term for the programming I feel our minds have been subjected to. For the most part, I think a lot of our thoughts are not our own, but are meticulously planted there. Personal experience, contemplation and the resulting growth is one thing, but looking at someone on TV and adopting the ideas of others because they are popular and because of fear is another. I see that your concepts are much more of the “bigger picture” than what I was trying to convey with this article. I am so appreciative of that. And it’s funny you should talk about a scapegoat, because since I wrote this article I have been less and less concerned with my scapegoat (ego) and more concerned with simply understanding myself as a whole entity and accepting the fact that I simply don’t know a lot of things and that it’s okay not to know. I guess I did come to the realization that my ego is a fallacy within itself, but the thought hadn’t reached the surface yet. It must’ve been trapped in my subconscious “spooky” mind 😉 I very much appreciate you sharing your thoughts with me, as you know, I am quite a fan of them. Thank you! That is truly beautiful and so true! Thank you so much.